von donnerstag bis samstag war ich zusammen mit connyLu in birmingham zum festival of quilts. es war wieder eine phantastische ausstellung.... über 1300 quilts wurden in verschiedenen kategorien gezeigt und über 20 einzelausstellungen von namhaften textilkünstlern oder gruppen. unter anderem ricky tims, jaqueline heinz, bente vold klausen, quinTEXsenz, ungarische gilde und und und. nicht zu vergessen die ladenstrassen.... dort kann frau so manches pfund lassen *g*. es werden verschiedene workshops angeboten, an einigen ständen führen leute div. techniken vor, alle namhaften nähmaschinen hersteller sind vertreten und man kann die tollsten maschinen probe nähen. das ganze ist verteilt auf 2 riesige messehallen. die luft in der halle ist dank der klimaanlage immer angenehm. letztes jahr waren über 27 000 besucher aus 50 ländern angereist. die stimmung ist immer toll und es sind nur nette und freundliche leute dort. eingekauft hab ich natürlich auch. da gibts soooooooo viele schöne sachen auf einem fleck. eine riesen auswahl. stoffe in hülle und fülle, die schönsten garne, anleitungen, zubehör (nützliches und unnützes...) allen möglichen schnick und schnack. der geldbeutel ist schneller leer als man sich umschauen kann. aber es lohnt sich allemal. abends, nach der show hatten wir sehr schöne stunden mit ein paar quiltfriends verbracht. lecker essen, plaudern, lachen, show und tell der ergatterten schätze. es war alles in allem ein tolles event. nächstes jahr werden conny und ich wieder fliegen. from Thursday to Friday I was with "connyLu" in birmingham at the festival the of quilts. it was again a fantastic exhibition…. over 1300 quilts in different categories were shown and over 20 single exhibitions of considerable textile artists or groups. 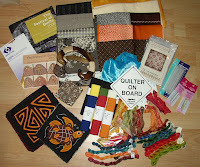 among other ricky tims, jaqueline heinz, bente vold klausen, quinTEXsenz, the Hungarian quiltguild and and and. the shopping streets do not forget…. different are offered workshops, at some conditions lead people div. techniques forwards, all considerable sewing machines manufacturers are represented and one can the maddest machines rehearse sew. the whole is distributed on 2 enormous halls. air in resounds is always pleasant owing to the air conditioning system. last year over 25,000 visitors from 50 countries had traveled to the show. there the tendency is always mad and it is only nice and friendly people. my absolutly highlight was the exhibition of ricky tims. I like his quilts very much. the colors, the quilting, the layout, everything. ricky tims was always locally. he gave patiently autographs, answered all questions and talk with the girls, he was always friendly and had a laugh in the face (or it was because of the many women it to have always surrounded *g*) shortly before i takeoff i pleased him for a picture with him and me. he said "ok" and i am very very proud to have this picture!!!!! there ' s gives soooooooo many beautiful things to buy. giants a selection. beautiful fabrics allover, the most beautiful yarns, patterns, accessories (useful and useless…). the purse is faster empty than you can look. 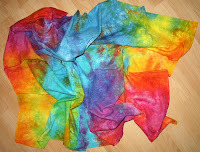 from my all-all-last money, I bought me a wonderful kind from ricky`s self died fabric. then I had only 33 pence in the bag. in the evenings, after the show we had also spent a very beautiful time with some quiltfriends. eat,talk, laugh, show and tell from the fabrics. it was all in all a mad event. next year conny and I will again fly. selber hätte wahrscheinlich auch einen Goldesel mitnehmen müssen! Wunderschöne Sächelchen hast Du dort erstanden, vor allem die beiden Mola- Blöckchen. Der Name Ricky Tims ist mir schon öfters begegnet aber jetzt sehe ich einen wunderschönen Quilt hinter euch beiden, ich werde mal die HP von diesem Künstler suchen müssen.